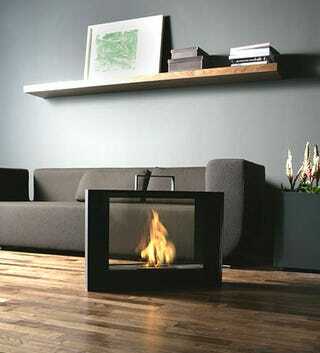 Fireplaces are great for ambiance, but generally not portable. Kooky German design firm Conmoto, who brought us the bookshelf fireplace back in December, has solved the portable problem with the Travelmate Portable Fireplace. At 55 lbs. it will require a little effort to cart it from room to room, but we think the resulting night of intimacy, wherever it happens to be, will be well worth the strained back. The Travelmate boasts some environmental benefits too. The small fuel tank uses bio-ethanol, which burns for 2.5 to 3.5 hours.